This is an exogenous transformation for translating an Ecore model to a relational database model. This example makes extensive use of nested multi-rules. The purpose of this example is to show how this concept can be used to construct complex and powerful rules. Note that this example could be also modeled with simple (but more) rules in Henshin. This example requires Henshin 0.9.3 or higher. The transformation, source code and example input / output models can be found here. The transformation consist of one main unit and two rules. The main unit is depicted below. The main unit is a sequential unit. It first executes the rule CreateSchema and then the rule CreateTableInterrelations. The two parameters of the main unit are passed to the CreateSchema and back again. Note that there is no loop involved: the transformation literally consist of two rule application, no matter how large and complex the input model is. CreateSchema: Creates a schema for a given package. tab: Creates a table for every class in the parent package. col: Creates a column for every attribute in the parent class. PKey: Marks the columns of ID-attributes as key columns. newPKey: Creates a new key column if there exists no ID-attributes. The second rule, called CreateTableInterrelations, is shown below. This rule creates the for all EReferences the corresponding table relations. For 1..1 references, the rule creates a new column in the table and a foreign key pointing to the target column. For 1..n references, the rule creates a whole new table that contains the links. 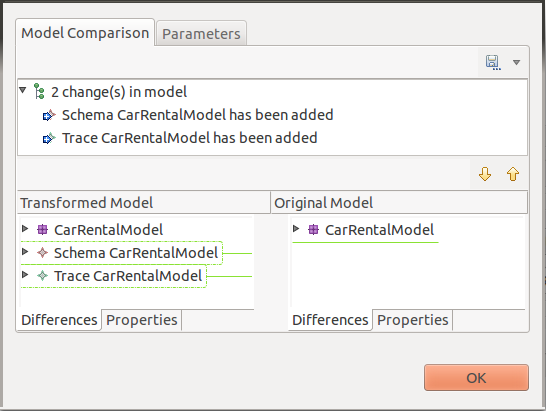 It shows that the created Schema object and its contents. There is also a new Trace object which could be used to check the correspondences between the Ecore and the RDB model. There is also a stand-alone Java application in the example directory which you can use to execute the transformation programmatically.